GSNC's 2013 Invention Convention Encourages Girl Scouts to Think Outside the Box (or Maybe with it!) As They Create Objects Out of Recycled Materials. 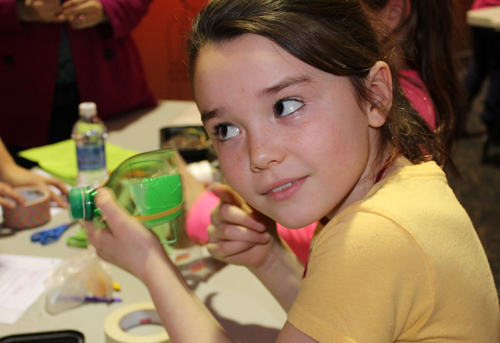 Last Friday night (February 22), a crowd of over 100 people gathered at the Cradle of Aviation Museum for Girl Scouts of Nassau County's first Invention Convention for Girl Scout Brownies. The girls came ready to DISCOVER more about the world around them, to CONNECT with other girls, the Museum and GSNC volunteers and staff on some cool ideas, and then to put those Discoveries and Connections together to TAKE ACTION by creating their own musical instrument and chair made from recycled materials. Girls also participated in an exercise where they designed and built a space station on Mars or the moon. All of the activities were in the halls and galleries of the Museum, where the girls were surrounded by marvelous inventions at every turn! It was a fun filled and active night! 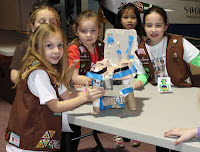 Girls rated making musical instruments as their favorite activity, followed closely by building the chair... The musical instruments were a more individual creative pursuit, whereas the chair required lots of teamwork and DECISION MAKING. (Wonder if the girls called upon the skills they learned in the Girl Scout Cookie Program as they were making those decisions?) As an observer, it was obvious to see various leadership skills - and styles - in action! Thanks to our partners at the Cradle of Aviation Museum for their help in creating this fun event! Special Shout out to the two FLL Robotics Teams that came to demonstrate and show their support for STEM and to all of volunteers for their support throughout the evening... and to the Leaders and parents who made sure their girls had this great experience. Why Do Girl Scouts and Girl Guides Celebrate World Thinking Day on February 22? World Thinking Day and the History Behind the Day that Girl Scouts and Guide Guides Around the World Celebrate. Every year, on February 22, Girl Scouts and Girl Guides all over the world celebrate World Thinking Day. We honor our sister Girl Guides and Girl Scouts by taking the time to give thanks for our international friends and to remember that Girl Scouts of Nassau County isn’t the only group of Girl Scouts out there; that we are part of a larger community of Girl Scouts and Girl Guides. But, what is the history behind World Thinking Day? In 1926, at the 4th International Conference, held right here in New York at the Girl Scouts of the USA's Camp Edith Macy, Girl Scout and Girl Guide delegates chose February 22nd as Thinking Day with the thought that there should be a special day to “think” about our sister Girl Guides and Girl Scouts; circling the globe with a chain of thoughts of international friendship and world peace. The date February 22 was chosen because it is the mutual birthday of Sir Robert and Olave Baden-Powell. The first Thinking Day was celebrated in February 1927. In 1999, at the 30th World Conference, Girl Scout and Girl Guide delegates voted to change the name of the day from Thinking Day to World Thinking Day to emphasize the importance of global thinking among Girl Scouts and Girl Guides (USA, 2005). In 2013, your Troop can celebrate World Thinking Day with a ceremony and multicultural activities which revolve around this year’s theme of girls' worldwide say "together we can save children's lives,” which focuses on issues that affect the lives of other children. There are two ceremonies typically done on World Thinking Day, the World Trefoil Pin Ceremony and the Thinking Day Friendship Flame Ceremony. Girl Scouts in the USA can also work towards earning the World Thinking Day Award for their level. Recently, we asked a group of Girl Scouts who participate in the Girl Scouts of Nassau County Chorus to create a video on Girl Scout Cookies. 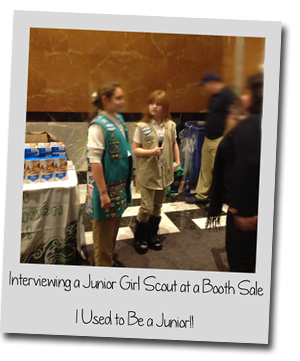 During the 2013 Girl Scout Cookie Booth Sale Kickoff, three Girl Scouts from the Girl Scouts of Nassau County Chorus asked other Girl Scouts and Girl Scout Volunteers what tips they had for selling Girl Scout Cookies. Let people know that Girl Scout Cookies are more than just a treat! 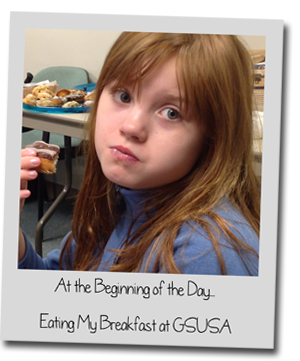 GSNC Girl Scout Cadette Spends National Girl Scout Cookie Day Being a Roving Reporter for GSUSA!!! My Day Interviewing at National Girl Scout Cookie Day!!! On Friday February 8, 2013, I went into the city to be a roving reporter for National Girl Scout Cookie Day. Unfortunately, it was the day we were expecting a blizzard. My day began at about 5:30 in the morning. That was when the car came, but I woke up at 4:34 in the morning. Our first stop was Fox & Friends. The new Girl Scout Cookie Truck was there and they interviewed us in the truck. My sister was also there, along with a Girl Scout troop from Brooklyn. They were going to work the first cookie truck stop. They were really nice. 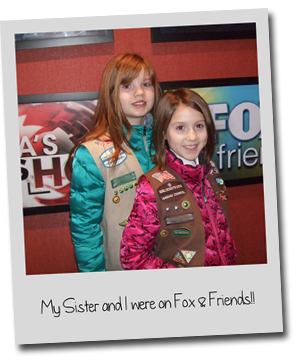 After Fox & Friends, Regan (the other Girl Scout Roving Reporter... she's a Girl Scout from Greater New York) and I started interviewing people on the street. We met Anna Maria Chaves, Miss Teen Kansas, two Brooklyn Net Cheerleaders, and Bill O'Rielly. We also spoke with people on the street, Girl Scout Troops selling Girl Scout Cookies, and lots of Girl Scout staff. I heard that by 1:00pm the Cookie Truck had sold about 2,000 boxes of cookies. My day was amazing even though the weather was terrible. The camera crew and staff that were with Regan and I the whole day were awesome!!! This opportunity gave me a sneak peek of how they run things at Girl Scouts. It was a GREAT day to be a Girl Scout! I am so grateful for the opportunity to be a part of National Girl Scout Cookie Day!!! P.S. Click here to watch some of my interviews from National Girl Scout Cookie Day. We are Girl Scouts! We spend our time learning new skills, making others smile, and volunteering our time to help others… those words “to help people, at all times..” are in our Girl Scout Promise. But, have you ever thought that simply doing a Random Act of Kindness could go a long way to making someone smile and helping to make their day a whole lot brighter? 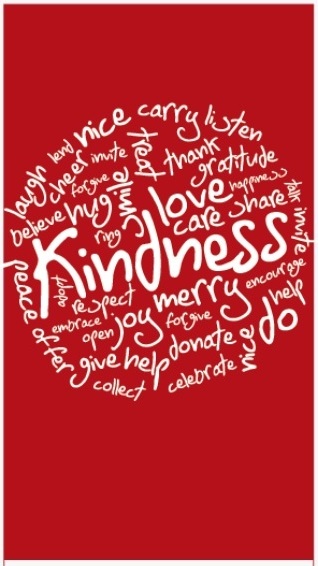 This week, February 11-17, is Random Acts of Kindness Week! Go out into the world and take part in Random Acts of Kindness. Buy a cup of coffee for the person in line behind you. Smile at the people who walk pass you on the street. Let someone go ahead of you in line at the cafeteria. Draw a smiley face on a post it and leave it on the desk for the person in the class after you. All these kind acts will make other people smile.